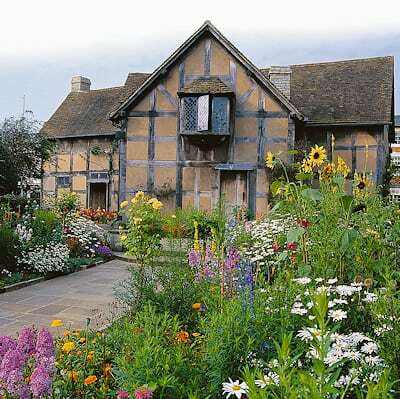 The Shakespeare Birthplace Trust cares for the five historic houses and gardens relating to William Shakespeare in and around Stratford-upon-Avon. With three homes in the town centre within a 15 minute stroll of each other and two country houses less than three miles apart, each of the houses and gardens tell a different story and can be visited in a day. Garden tours are available to pre-book and there is a programme of garden events throughout the year. The gardens team will be delighted to share information about the gardens they proudly care for. A formal garden with show stopping displays of seasonal colour framing the birthplace of the world's most famous playwright with resident acting troupe Shakespeare Aloud! performing on demand. The vacant plot where Shakespeare's family home once stood has been reimagined by award-winning artists. Wander through the glorious Great Garden and Tudor Knot Garden with their stunning sculptures and monthly garden demonstrations (April to September). Susanna and her husband Dr John Hall, with a serene walled garden with medicinal herbs providing a peaceful oasis in the heart of Stratford-upon-Avon. Nestled in nine acres of woodland and glorious gardens this quintessential cottage is one of the most photographed in the world. An organic Tudor working farm in rustic farmland with woodland area, nature trails and a wildflower meadow. Group Tours: Savings available for parties of 15 or more. Facilities: Cafes at Anne Hathaway's Cottage, Hall's Croft & Mary Arden's Farm. Gift shops at all sites. Events: Special events, seasonal activities, talks and bespoke tours available. Disabled access: Shakespeare's New Place is fully accessible. Other Houses vary - please see website for full details. Blue Badge parking available at Anne Hathaway's Cottage and Mary Arden's Farm. Parking available in close proximity to other sites. Assistance dogs welcome at all sites. Please visit the facilities section of each house on the website. Toilets: Yes, including accessible toilets at all sites. Coach/Car parking: Coach dropping-off point near Shakespeare's Birthplace. Hall's Croft and Shakespeare's New Place are in the centre of town, a short walk from town centre car parks. Free parking at Mary Arden's and for a small hourly charge at Anne Hathaway's Cottage.